If a week is a long time in politics, five years is a lifetime in retail. On Saturday, July 1st 2006 – armed with books and a bubble machine – we opened the doors of our shop. This Saturday we will be serving champagne and cake, and we invite you to drop in and celebrate our fifth birthday with us. During the five years that we’ve been open – in fact, even before that – this blog has been an integral part of Mostly Books, a sort of ‘running commentary’ of what we did and how we did it. At the beginning we never really thought anyone would read it, and it was very much a warts-and-all look at two enthusiastic, but possibly deluded, neophyte booksellers following their dream. But even from the first few posts we started to get readers – and more importantly commentators – who, looking back, probably couldn’t bear to watch a potential car crash happen, and weighed in with all kinds of suggestions, tips and assistance which made (and continue to make) a huge difference in the success of the shop. 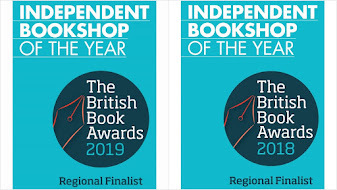 Looking back through the 316 posts we’ve made over the past five years (approx one post every six days apparently) you get an accelerated and very scary whistle-stop tour through five incredible years of bookselling. I did this last night, and I’m still reeling. The story (the way the blog tells it) seems to go like this: Couple have dream to open shop, start blogging, muse on the difficulties of everything from shelving to stock selection, indulge in slightly naughty underhand spying missions to nearest large city which catch the imagination and advice starts to come in from authors and booksellers from around the world. 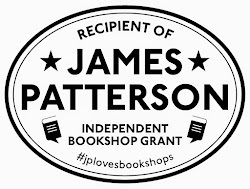 Shop opens, congratulations follow, amusing posts on the realities of running shop (hard work), dealing with customers (a joy) and interacting with the wider book trade in getting hold of obscure orders (often complex to the point of baffling insane). First events start happening, Christmas arrives leaving bookselling couple happy, but in heap on floor on Christmas Eve. New Year sees events start to get bigger and more complicated, hiatus caused by change of lifestyle having unforeseen impact on family life (a baby) then threatens to become crisis with apocalyptic floods, over-ambitious outdoor event and first Harry Potter launch, but victory and triumph snatched from jaws of defeat with New Bookshop of the Year Award. Cue stream of celebrity authors, courses, appearances, a radio gig, fame and fortune. That’s the way the blog tells it of course. But the blog is ever-so-slightly one-sided. It gives a resolutely positive and, yes, spun side to events. What doesn’t appear on the blog are the mistakes that were made (several biggies), errors of judgment (many) and the things that didn’t come off (or, more usually, came off in ever respect apart from commercial). It doesn’t record the dark teatimes of the soul and late-night impromptu planning sessions over one-too-many glasses of wine as we tried to solve problems, change tactics and work out how the hell you make a bookshop work in the 21st century. At the heart of it, it is difficult to over-emphasise just how demanding bookselling is on a day-to-day basis. Retail is physically demanding anyway, but bookselling has the added intellectual exertion that comes from a constant shifting of the mental gears as you switch between “recommendations for a bright 5 year old who likes dragons” to “a 60th birthday present for my Uncle who doesn’t read much” to books on infant sleep problems, diabetes and bereavement. Those last subjects hint at a third element, one unique I believe to independent community retailing; the emotional demand that comes from sharing with customers, and them sharing back. It is the most incredible thing, and is what Anna Dreda at Wenlock Books once described to me as the magic that can happen in a bookshop when you recommend just the right book. There are plenty of people who get ground up by modern life, who – for all kinds of reasons – find they suddenly don’t fit into the neat systems of megalithic and Internet-powered modern business, and are in danger of getting squashed by the tectonic plates. At that particular moment, local community retailing – and bookshops in particular – provide a haven from the madness, and a place where they can simply talk to someone who can, in a very basic way, sit them down, give them a cup of tea, try to understand their problems, and genuinely care enough to work hard to suggest some answers. Sometimes this does not involve books even. Many of our customers have become friends, and we have watched children grow up (and even start working in the shop). On the flip side, Abingdon has many families who are here for a short time, and it is always sad to see cherished customers moving away (although we try to recommend them a good bookshop before they do). In the first year we were open, a customer (who we now know extremely well) described us as “sentimental amateurs”, and that was probably a not altogether inaccurate description of how we started. But as we’ve grown in confidence, as we’ve understood what we do well (and more importantly, what we don’t do well) I like to think we’ve hung on to all that’s good about sentimentality (caring about our customers) and amateurish-ness (open to new ideas) but this is now housed under thicker, and more rugged bookseller skin that allow us to run a much more professional and effective operation. For now, this Saturday, Nicki and I will be in the shop to celebrate heartily with whoever comes in. Thank you seems a fairly inadequate expression for how we feel, but really – a heartfelt thank you to the many, many wonderful people who have helped make the shop the success that it is. If you are in Abingdon on Saturday, please do drop in for some champagne because we would love to see you. I’m sure five years has seen plenty of changes in your life – why not come in and mark this as well? And if you can’t make it to the shop, post a happy birthday message below, tweet something suitably birthday-ish, or drop by our Facebook page and let us know you’re thinking of us. It means a great deal to know you’re with us, we’ve come a long way in five years and we couldn’t have done it without you. One more thing I meant to say in the blog: this weekend, wherever you are, go seek out an indie, discover the amazing things that they do - and buy a book! Many many Congratulations, didn't you do well. You are unique - hope the good folks in Abingdon appreciate this. Happy 5th birthday to everyone at Mostly Books! Thanks for recommending many great books over the last couple of years - your staff are second to none for knowing just the right book for every conceivable type of reader. And a huge thanks for holding the event which inspired the founding of Abingdon Writers and for continuing to support us! Five years - they've passed in a wink. The bookshop has opened my eyes to much in that time, from both sides of the counter! There's a strange sort of serendipity in the fact that your 5th Birthday falls on my publication date. Who will ever know if life would have taken that path otherwise? Here's to your future and enjoy both varieties of bubbles! martriarchy - thanks very much, been a long road, but we're still enjoying it. Over the last five years you have introduced me to local writers and celebrities from all over the country, so thank you and many happy returns! Mark and Nikki - I can hardly believe that it must be more than five years since you came to visit! Congratulations on on your hard-earned and well-deserved successes,and may the next five years be golden! The challenges increase all the time, but the real joy of what we're doing continues to make it all worthwhile. Well done! Enjoy the champagne, and have a great day off tomorrow!? Much love, Anna. Hope you had a fabulous day. Anne and I, both unable to be with you on Saturday, called in on Friday to say 'Happy Birthday'. And decided that the only sensible birthday present we could give you was to buy a book (or two) each. So we each got a present ourselves - how mutually satisfying was that? Hope you have many more wonderful birthdays, and continue to surprise and delight us with recommendations, fantastic events, and generally adding to the gaiety of the nation. Happy 5th birthday, sorry I'm late in saying so! I hope you enjoyed your celebrations. Great blog, and congratulations on 5 years of Mostly Books! Check out my blog about books at goodbookblogger.blogspot.com !